Drumlanrig's Tower was originally a 16th century stone L-plan tower house, founded by the Douglas family. 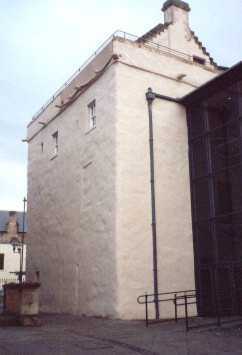 Of three storeys and a garret, the basement in the main block was vaulted and the hall stood on the first floor. Standing inside a late 12th or early 13th century ditch, at least two splayed gun-loops guarded the entrance in the re-entrant angle. In 1701-2 the Queensberry family extended and reconstructed the tower, when they infilled the angle to square off the block but much of the original L-plan layout still survives. Now a large comfortable town house, the floors in the wing match those in the main block and both are reached via a corridor from the spiral stair. Nearby is Hawick Motte and 16 miles south is Hermitage Castle. Drumlanrig's Tower is located in Hawick, off Tower Knowe. 11 miles west of Jedburgh, on the B6358-A698. The site is now the Borders Textile Towerhouse and is open daily, April to October Monday to Saturday 10:00-4:30pm Sunday 12:00-3:00pm, November to March Monday, Wednesday to Saturday 10:00-4:00pm.